Since the business was first established in 1816, J and G Mossman Ltd has continued to provide high quality service to the local community in Central Scotland. Whether you are searching for a new headstone to mark the final resting place of your loved one or are searching for experienced headstone repairers and restorers, we are able to help you. 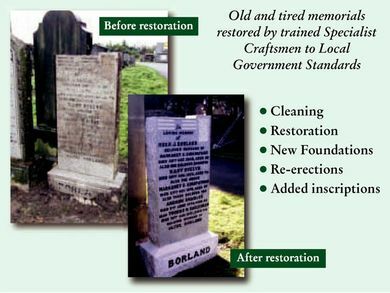 Old and tired memorials are restored to local government standard by trained, specialist craftsmen. Come to us today for professional gravestone repairs. New inscriptions can be added to existing headstones and we are happy to carry out work in any cemetery. Our prices are competitive and we also offer free quotations. When choosing a new headstone, we are always happy to talk through your options with you, ensuring that you are happy with your final selection. To speak to a member of our team regarding your requirements, call us today on the above number. Enquiries can also be sent to us via email by filling in the form on our contact page. We are sure that you will come back to us for all of your memorial cleaning requirements.